At the end of Malignant, the entire staff of Awesome Hospital walked out on their old jobs. Now, as we wait to find out what’s happening in the future, we’re back at the present checking in with the woman who was formerly AH’s most reliable nurse, Cindy Punk Rock! Anarchy in the OR comes courtesy of JoJo Seames, with a plot by our own Chad Bowers! If you like Chad and JoJo (and who doesn’t? ), then check out their comic, Monster Plus, every Wednesday from the Action Age! Cool. So this is a guest mini-arc? Not sure I’ve seen one of those before. 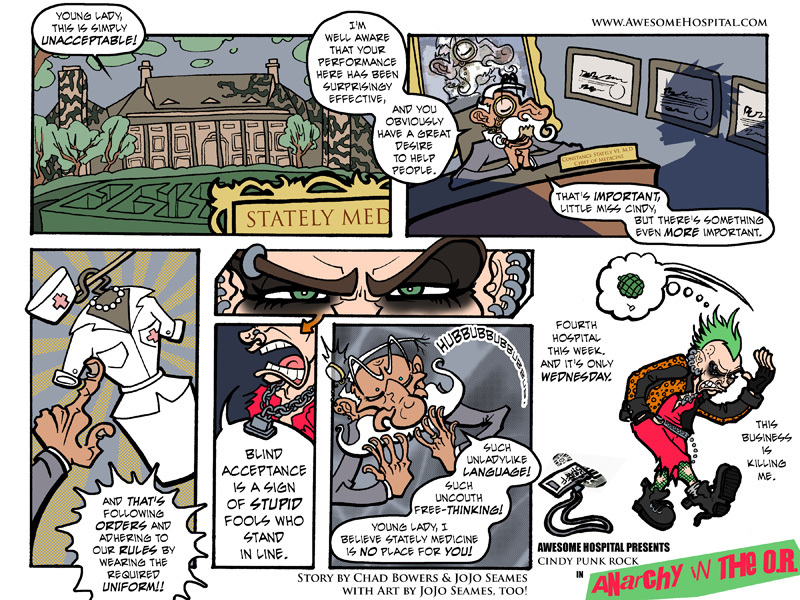 We did have the Dr. Bulldog on a Skateboard murder mystery arc before, so it’s not unprecedented here at AH.